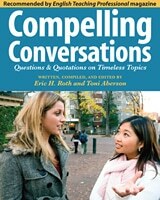 Compelling Conversations: Questions and Quotations on Timeless Topics can help you create stimulating English conversations. Focusing on essential fluency skills, Compelling Conversation guides English language learners in exploring our changing world and learning English by doing. Your English Students Speak More! Get Your Students Talking – In English! This critically-acclaimed, fluency ESL/EFL textbook series features thematic chapters to create quality conversations. The fluency-focused, communicate books use conversation starters, interview questions, classic quotations, paraphrasing exercises, and traditional proverbs. English language learners share experiences, enjoy lively discussions, and create hours of meaningful conversations. The art of conversation, once considered the sign of a civilized individual, seems less common today. To people learning English as a second, third, or fourth language, English remains a strange, confusing, difficult, and misspelled language – and it’s easy to feel uncomfortable when speaking in this new tongue. This book helps create memorable English classroom conversations and includes 45 self-contained chapters, asks over 1,350 stimulating questions and features 500 memorable quotations. Chosen by English teachers and tutors in over 50 countries! This book is aimed at newcomers to the United States, recent and not-so-recent immigrants, who may be studying at an American high school, adult school, community college, or university. 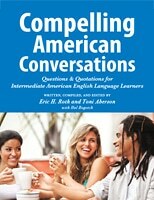 Focused on the needs and aspirations of intermediate English language learners, the text shows a variety of ways to create and sustain authentic conversations with a developing English vocabulary, challenging them to reflect and speak about their lives and experiences on 15 topics in class and in English. 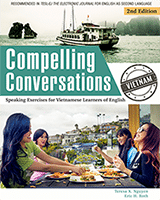 Created for advanced Vietnamese English Language Learners, this book includes thematic chapters to create quality conversations and uses conversation starters, interview questions, classic quotations, paraphrasing exercises, and traditional proverbs to create hours of English conversation and class discussions. It helps students develop greater fluency, develop and express their opinions, build critical thinking skills, prepare for standardized tests with speaking sections (TOEFL, IELTS), and create authentic conversations. 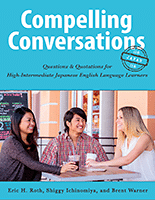 Designed to help Japanese English language learners describe their lives, share their experiences, and develop their critical thinking skills, the innovative conversation book includes activities for asking questions, paraphrasing proverbs, expressing opinions, comparing ideas, summarize articles/videos, discussing Japanese objects, and give reviews. Each chapter concludes with a communicative exercise where students find articles/videos online, summarize the material, and evaluate the information. Immigrants need to feel comfortable speaking English, but too often students learn everything except conversation in ESL classrooms. Compelling Conversations allows students to learn by speaking. A wonderful source of materials triggering authentic (not stilted) communication. Compelling Conversations topics are timely, meaningful, and presented in such a way as to stimulate immediate class participation. If I had to sum up what I loved about Compelling Conversations in one sentence, I would say that it contains the recipe for making anyone a great conversationalist! From my own background in classrooms on three continents I can say that this rich collection of material would be an ideal addition to the toolkit of any teacher still inspired by the notion of free speech.